Martian “gullies” are a class of landforms on steep slopes, characterized by an upper alcove and a depositional apron, linked by a channel. On Earth, similar features would likely be termed ravines or alluvial fans. The Martian features usually appear geomorphically fresh, with sharply defined channels and no superposed impact craters. Changes were first detected in Martian gullies over a decade ago, and such observations have become more common as high-resolution repeat image coverage has expanded. This current activity correlates with seasonal frost (which is mostly CO2 on Mars) and has resulted in substantial modification of some gullies, leading to a debate over whether CO2 alone is sufficient to form them without liquid water. Image 1: Subsection of HiRISE image ESP_023809_1415 (https://www.uahirise.org/ESP_023809_1415) at reduced resolution, providing context and an overview of the gully system. North is up and light is from the upper left. Post contributed by Oliver White, Search for Extraterrestial Intelligence Institute. Io is the innermost Galilean satellite of Jupiter, and with over 400 active volcanoes, it is the most volcanically active body in the Solar System, a consequence of tidal heating from friction generated within its interior as it is pulled between Jupiter and other Galilean satellites. Constant volcanic resurfacing means that the oldest surface is likely not more than a million years old (Williams et al., 2011). No instrumentation specifically designed to measure topography has ever been deployed to Io, but White et al. (2014) constructed a global digital elevation model (DEM) covering ~75% of Io’s surface from all available stereo coverage in Voyager and Galileo imaging, and controlled it using Galileo limb profiles (Image 1). This map represents a continuous topographic dataset that has revealed topographic variations not otherwise apparent in Voyager and Galileo imaging and limb profiles, and which may be correlated with geologic units (e.g. Williams et al., 2011). While not providing coverage across the entire globe, the map stands as the most comprehensive continuous topographic data set of Io’s surface, at least until a spacecraft arrives at Io with a dedicated photogrammetric camera or a laser altimeter on board. 2 km/pixel. Gaps in the DEM represent masked noise or absence of stereo coverage. A broad smoothing filter has been applied to the plains areas of the DEM post-mosaicking but not to comparatively high relief features such as mountains, layered plains, and some paterae (volcanic craters). The width of the map at the equator is 11,445 km. Sedimentary basins on Mars, they contain a lot more sediments than we thought! The nature of the early Martian climate is one of the major unanswered questions of planetary science. 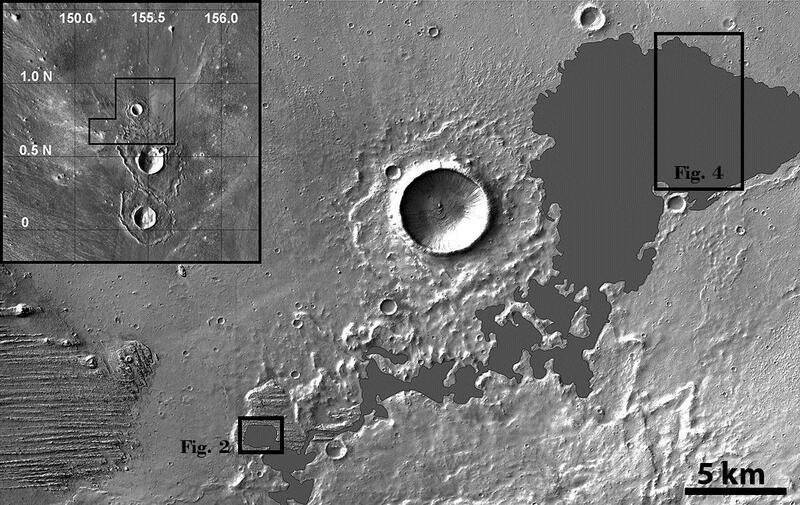 To date the geologic evidence that Mars once had large amounts of surface liquid water is conclusive, but geomorphic constraints on the duration for which that water flowed are much weaker. In addition, much of the geochemical evidence points towards surface conditions that were not warm and wet for long time periods. The evidence points towards a hydrological cycle that was intermittent and not permanently active 3.8 billion years ago. However, in a recently published article myself and colleagues report that flowing water and aqueous environments formed thick, widespread sedimentary plains 3.8 billion years ago in the northern rim of the Hellas basin on Mars. Image 1: 3D view of the northern Hellas plains, including hills, plains, erosional windows, and impact craters with their interpreted lithology. Mosaic of CTX images draped on MOLA topography. Geomorphology of terrestrial planets provides important insights into how various exogenous (e.g., meteorite impact, wind activity, glaciation) and interior geological processes (e.g., tectonics, volcanism) interact with the planetary surface. The tectonic features (faults, folds and fractures) shed light on the past and on-going seismo-tectonic processes operating on a planetary body. On Earth, seismometer networks are used in the direct instrumental observations of earthquake locations and their sizes for many decades. For other planets, seismic observations are rare. On the Moon, Apollo seismometers recorded moonquakes only during a brief period of 1969-1976. Annually, about 2000 deep moonquakes originating at 800-900 km depth, tens of shallow moonquakes at 0-100 km depth and around 200 meteoroid impacts were observed (Nakamura et al., 1979; Nakamura, 1980). While the deep moonquakes are produced by tidal forces, the sources of shallow moonquakes are thought to be of tectonic in origin. However, crustal tectonic structures responsible for shallow moonquakes are poorly understood. Figure 1: (upper panel) LROC NAC images showing the en echelon pattern of a lobate scarp, located near the southern basin wall of Schrodinger basin. Hundreds of boulder falls and their trails are found on the basin wall about 5-7 km south of the lobate scarp. The boulders are shown as points (open circles filled with yellow) and are not to the scale. Note the largest number of boulder falls is seen between 129° and 130° longitudes. (lower panel) LROC NAC (M139078014RE) image showing the boulder trails of variable lengths and widths containing some prominent boulders at the terminal ends of the trails. A 23 m diameter boulder (labelled), the largest in this scene, produces a trail (also labelled) slightly wider than the boulder indicating a possible size reduction during its transport from the source region to its current location. Most boulder trails criss-cross each other. Everyone has a story. The narrative of who we are is created by us, our actions and interactions, sometimes just drifting with the events we live through. Landscapes like the one shown in Image 1, tell a geologic story. We translate it to human language and categories. Landscapes are the interface between a planetary body, its atmosphere and the cosmic environment. They change, age, and renew. A flood from a distant source, an impact, settling dust, all imprint onto it. Its history is recorded in its materials and its relief. With age, it depicts an ever more complicated story until resurfacing destroys its history. It’s increasingly popular to explain geology by processes. In real life, however, processes are not always clear cut and as we enter the age of multidisciplinary studies, many of us accept people who are different, we also recognize that landforms are shaped by a multitude of processes, they are not black or white, but all shades of… any color. Is a channel volcanic or fluvial? Well, maybe it’s both, and tectonic, too, with a pinch of ice-rich material that is of course sublimating. Even the types of question we can think of evolve, and this is happening in science, humanities and politics in parallel. Lowell’s Mars? Flat plains and marshes. Perhaps he didn’t even have enough creativity? Nature ‘s creativity always surpasses our own. Image 1: Kārūn Valles located on the rim of the Ariadnes Colles basin. The visible channel head and deep grooves are shown (detail of CTX image D10_031182_1435). (b) The Kārūn Valles alluvial fan. Note the elongated depositional bars and their wide distribution. (c) A zoom on one of the braided bars. The flow direction is indicated by dashed arrows (detail of HiRISE image ESP_043261_1440). The Amazonian period on Mars, meaning roughly the last 3 Ga, is globally believed to have been cold and hyperarid [e.g., Marchant and Head, 2007]. Recent geomorphological observations, however, have revealed the presence of well-preserved Amazonian-aged fluvial valleys in both the north and south mid-latitude regions of Mars [Howard and Moore, 2011; Hobley et al., 2014; Salese et al., 2016; Wilson et al., 2016]. These features point to one or several climate change phase(s) during Amazonian which could have sustained liquid water at the martian surface. These climate changes could have been triggered by obliquity oscillations [Laskar et al., 2004] causing the transportation of ice from polar regions and its re-deposition at lower latitudes. Episodic melting events during Amazonian, subsequently, formed valleys and other fluvial features, in the mid-latitude regions. A Mud Flow on Mars? Post contributed by Prof. Lionel Wilson, Lancaster University, UK and Dr. Peter J. Mouginis-Mark, Hawaii Institute of Geophysics and Planetology, USA. Image 1 shows a distinctive flow deposit southwest of the Cerberus Fossae on Mars. The flow source is a ~20 m deep, ~12 x 1.5 km wide depression within a yardang field associated with the Medusae Fossae Formation. The flow traveled for ~40 km following topographic lows to leave a deposit on average 3-4 km wide and up to 10 m thick. The surface morphology of the deposit suggests that it was produced by the emplacement of a fluid flowing in a laminar fashion and possessing a finite yield strength. There is an ongoing debate about whether flows in this region of Mars are lava flows or water-rich debris flows. Image 1: Location of the distinctive flow deposit, called Zephyria Fluctus, just north of the equator on Mars. The inset at top left shows the broader context of the flow. The grey area is the flow’s extent and black boxes indicating the position of Images 2 and 3 (Fig. 2) and Image 4 (Fig. 4). The inferred flow direction is from SW to NE. Mosaic of CTX images D01_027675_1806, D04_028941_1805 and G19_025697_1803. Post contributed by Dr. M. Ramy El-Maarry, Institute of Physics, University of Berne, Switzerland. The European Rosetta spacecraft went into orbit around comet 67P/Churyumov-Gerasimenko in Aug, 2014. Since then, the spacecraft’s imaging instruments, particularly the OSIRIS camera, have been sending images of the comet’s surface in unprecedented detail showing an amazingly complex landscape and a suite of geomorphological features that suggest many processes are currently at work and acting on the surface. 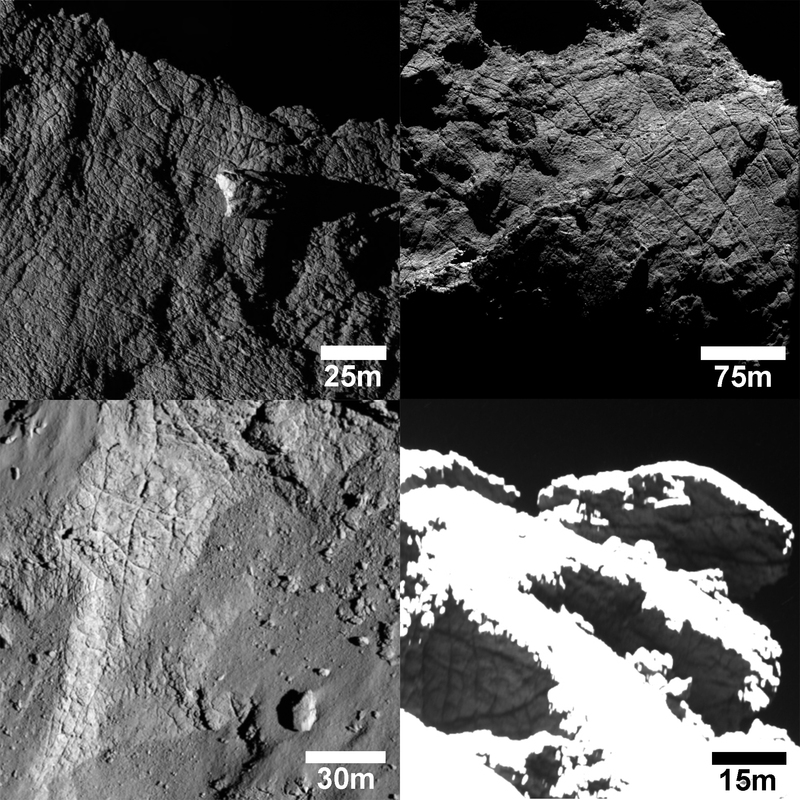 Image 1: OSIRIS images of various polygonal fracture systems on the surface of the comet.